This two story is truly traditional with formal and informal living areas downstairs and all four bedrooms upstairs. A living room and dining room allow for formal entertaining, while the family room, breakfast bay, and kitchen are open for a more casual, family atmosphere. Note the large, walk-in pantry. 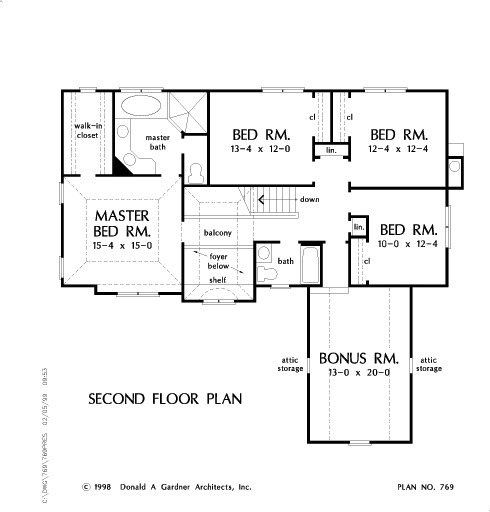 The second floor master suite is separated from three family bedrooms by a balcony overlooking the foyer below. A tray ceiling tops the master bedroom, which enjoys a sizable walk-in closet and private bath. A versatile bonus room is accessed easily from the second floor. 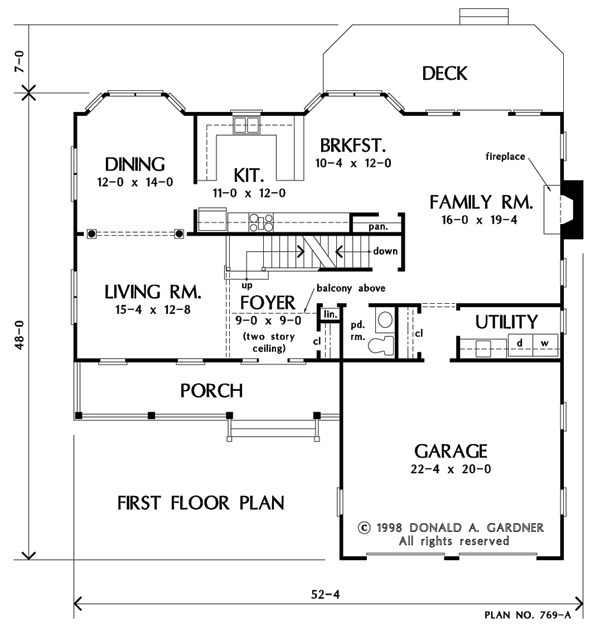 1st Floor: 1337 Sq. 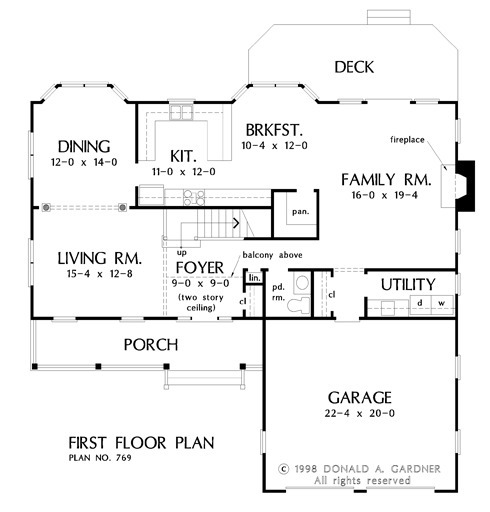 Ft.
2nd Floor: 1187 Sq. Ft.
House Dimensions: 52' 4" x 48' 0"
Great Room: 16' 0" x 19' 4"
Master Bedroom: 15' 4" x 15' 0"
Utility Room : 10' 4" x 5' 4" x 9' 0"
Bonus Room (Vaulted): 13' 0" x 20' 0" x 8' 0"
Master Bedroom (Tray): 15' 4" x 15' 0" x 11' 0"
Bedroom #3 : 12' 4" x 12' 4" x 8' 0"
Bedroom #4 : 10' 0" x 12' 4" x 8' 0"
Porch - Front : 27' 4" x 6' 0" x 0' 0"
Deck / Patio : 24' 8" x 9' 0" x 0' 0"
Balcony : 9' 0" x 4' 4" x 9' 0"
Foyer (Tray): 9' 0" x 9' 0" x 19' 0"
Great Room : 16' 0" x 19' 4" x 9' 0"
Breakfast Room : 10' 4" x 12' 0" x 9' 0"